"Designed to Inspire”, all Ibanez Premium series are manufactured with select tone woods, high-profile electronics, and hardware. They are built by highly skilled craftsmen for your musical journey. 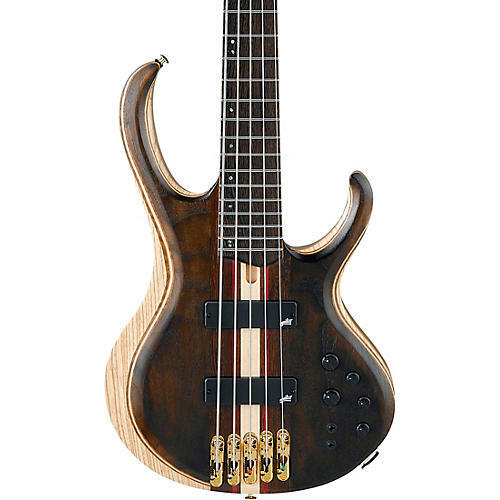 The ever-evolving Ibanez BTB series has always aimed to expand the player’s range of creative expression. The elegantly contoured, massive body of select tone woods combines with dedicated hardware and electronics to produce huge, rich tones. Neck-through construction, a two-octave fretboard, and a super-deep cutaway, promise sleek playability and enduring sustain. The BTB series defines what the “Boutique Bass” is all about. The BTB1805 is a 5-string bass featuring an Ash wing body with a Walnut top and back, for tonal clarity and a superior attack in sound. The 35” scale 9pc Panga panga / Purpleheart / Maple neck-through design is supported with graphite rods for massive sustain and excellent stability. A Panga panga fretboard sports stainless steel frets with Premium fret edge treatment for a bright tone, high durability and super smooth playability. A “zero” fret provides accurate intonation, while allowing open strings to ring with the same resonance as notes played up the neck. The electronics include Aguilar DCB pickups, providing a dynamic and responsive attack, well-developed overtones, and singing sustain. Combined with the Ibanez Custom Electronics 3-band EQ w / EQ bypass switch, and 3-way mid frequency switch, the BTB1805 offers immense tonal possibilities for any playing situation. The Mono-rail 5S bridge enables a wider intonation adjustment range, and each isolated saddle is securely locked to the body for maximum vibration transfer with minimal sympathetic string interference. The principal feature of the new bridge is the saddles can be adjusted for various string spacing. The bridge was developed in an effort to meet the needs of various players who enjoy different string spacing. The saddles can be easily adjusted to widen or tighten the string spacing by + / -1.5mm. D'Addario NYXL strings are installed to expand the dynamic range and harmonic response. Other features include a secure high-tech Neutrik locking output jack and Gotoh machine heads. Case sold separately.